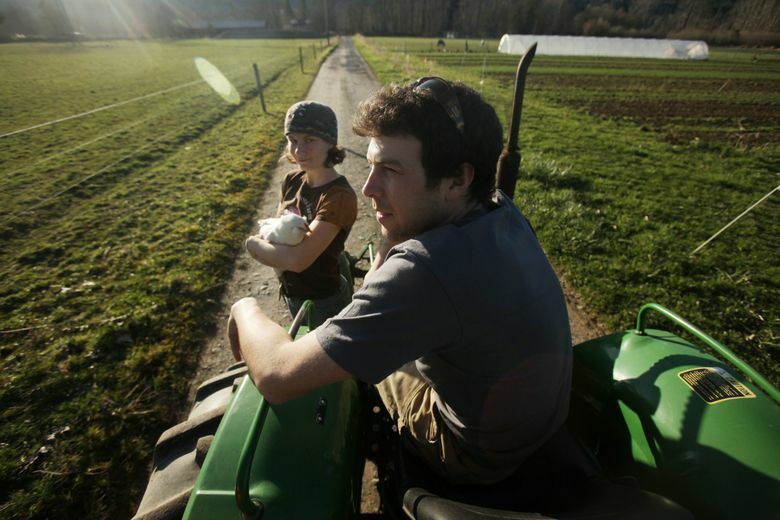 ALONG THE Snoqualmie River, between Seattle and the foothills of the Cascade Mountains, lies a fertile valley where Siri Erickson-Brown and Jason Salvo run the 20-acre Local Roots Farm. Local Roots grows about 50 vegetables to sell; star chefs Ethan Stowell, Renee Erickson and Matt Dillon are among its customers. The couple has noticed a trend toward drier summers. That means Local Roots needs to irrigate more, which adds costs for equipment and payroll. Salvo says his vegetables could get more expensive, but global warming is only one of the factors increasing costs. Like many farms, Local Roots pumps water from a river. Salvo worries about the impact of decreased snowpack and lower summer flows. “Long-term, if endangered salmon are threatened and there’s less water, then irrigation-intensive farming could disappear from the valley,” he says, noting that some habitat-restoration projects could negatively impact farmers and farmland. “If every place does that, where are we going to grow our food?” he wonders. Balancing farmers’ needs with fish-habitat protection in Western Washington is a complex issue that has state and local leaders, tribes, fisheries and farmers looking for new solutions. Decreased snowpack, declining glaciers and increased flooding are expected to put even more pressure on farms, fish and communities in the years ahead. Farther south, in the fertile Chehalis River Basin, Jay Gordon grows crops on land his family has farmed since 1872. “The big ‘aha’ moment for me was five or six years ago, when I was looking at the flood data,” Gordon says. “When you start to see a hundred-year flood every seven years, that’s the tipping point.” Five of the largest floods in Chehalis history have occurred in the past 30 years. Taking no action could cost as much as $3.5 billion during the next 100 years, according to the Office of Chehalis Basin, a group of leaders charged with improving fish habitat and reducing flood damage. Gordon, who is a member of the group, also serves as the policy director at Washington State Dairy Federation. Washington Department of Fish & Wildlife is one of the agencies working on these challenges. Clean, healthy rivers are vitally important to Washington’s future. Catherine M. Allchin is a Seattle food writer. Follow her at catherinemallchin.com.